The Honda Fit EV uses a 20-kilowatt-hour lithium battery pack supplied by Toshiba Corp.
LOS ANGELES (Bloomberg) -- Honda Motor Co., the first automaker to lease fuel-cell cars to retail customers, said advances in hydrogen-vehicle technology helped it create a battery-powered Fit that has the highest efficiency of any car in the U.S. The company will start leasing the Fit EV hatchback on July 20, for $389 a month, in California and Oregon. The car’s 82 miles (132 kilometers) per charge and 118 mile-per-gallon equivalent ratings top Nissan Motor Co.’s Leaf and Ford Motor Co.’s Focus EV, aided by components adapted from the hydrogen-propelled FCX Clarity, said Sachito Fujimoto, who’s overseeing both projects. Honda has tried to spark demand for fuel-cell cars, which make electricity for propulsion from hydrogen on board rather than storing it in batteries, since the company began leasing the Clarity sedan in Los Angeles in 2008. That effort has been stymied by the limited number of stations dispensing the fuel. California emissions rules pushed Honda and other major carmakers to offer battery-electric models starting this year, making the Fit EV program a near-term priority. Advances in the braking system for the Fit EV that recaptures 8 percent more energy from deceleration and stopping also will be applied to the Clarity, Fujimoto said. Honda plans to deliver 1,100 of the cars to U.S. customers in model years 2013 and 2014, Robert Langford, the company’s U.S. manager for plug-in electric sales, told reporters in Pasadena this week. 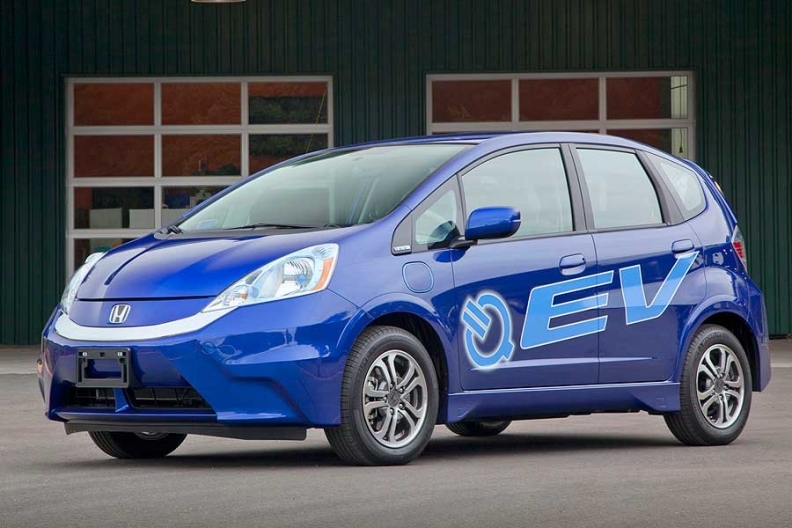 Fit EV availability will be expanded to New York, Massachusetts and other U.S. states in 2013, Honda said. Honda executives, including former President Takeo Fukui, have been skeptical of the mass-market appeal of battery-powered cars because of their limited range and lengthy recharging time compared with gasoline-engine autos. The Fit EV is intended to help Honda understand the market potential for such cars, said Robert Bienenfeld, senior manager at the company’s U.S. headquarters in Torrance, Calif.
With the addition of the Fit EV, Honda’s U.S. lineup includes vehicles powered by batteries, hydrogen, natural gas, gasoline and hybrid-electric powertrains. The goal for the Fit EV was to get as much driving range as possible using the smallest possible battery pack, Fujimoto said. The model uses a 20-kilowatt-hour lithium battery pack supplied by Toshiba Corp. that’s smaller than the 24-kWh and 23-kWh packs used in the Leaf and Focus EV, Honda said. The smaller battery size allows the Fit EV to recharge in three hours from a 240-volt outlet, half the time of Nissan’s Leaf, Honda said. The Environmental Protection Agency this month said the Fit EV’s 118 mpg-e rating is the highest given to any vehicle so far. EPA’s range rating for the Fit EV of 82 miles in combined city and highway driving also compares with 73 miles for Leaf, Focus EV’s 76 miles and 62 miles for the “i” from Mitsubishi Motors Corp.
Honda, which has leased only 25 Clarity sedans to California customers since 2008, needs to be ready to mass-produce zero-emission hydrogen and battery cars within a few years as energy and environmental circumstances change, Fujimoto said.